The digital rewards site Swagbucks is celebrating November with another big Swago promotion starting Monday, 6 November at 9am PT! Swago is just like bingo, but in this case you're filling out squares as you earn points on their site for doing things you already do online. If you're thinking of trying Swagbucks, this is a great chance to learn all about how the site works and earn bonus points while doing it, meaning you can get more gift cards faster. • Each square on your Swago Board will contain an action item to complete. They can be anything from getting a search win, completing a survey, or just visiting one of our popular stores! • Once you complete the action item in a particular square the square will change color signifying the action item is complete. • You have until 12pm PT/3pm ET on Monday, 13 November to mark off as many squares as possible so use your time wisely. • Be mindful of the patterns and their corresponding bonuses located on the right of your Swago Board. The patterns will vary in difficulty and bonus value. Once you’ve achieved a pattern, the corresponding Submit button will light up. You can have multiple patterns available for submission, however, you can only submit ONE pattern so choose wisely. • Each activity you successfully complete on your Swago Board will give you anywhere from 1-20 spins on the Spin and Win Wheel. PLUS, when you submit your board for a bonus you'll get additional spins. The number of spins will depend on the pattern you complete. The wheel has all sorts of great prizes that you can win, and each spin is a winner! The Spin and Win Wheel will be available all throughout Swago and you have until 11:59pm PT on Monday, 13 November to use all your spins. Fill up your board and then submit your pattern to get even more points - if you can fill in the whole board, you get a 300 SB bonus, which goes a long way towards your first gift card from the retailer of your choice. Click here right now and click Join to get started! 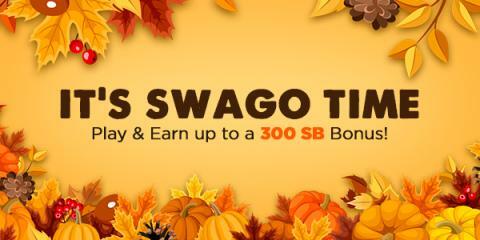 If you don't already have a Swagbucks account, you'll be able to quickly sign up; PLUS, if you earn 300 SB before the first of next month, you'll get a bonus 300 SB!